Age of vines: Over 50 years. Cultivation: Classic Trentino double pergola. Vineyard location: the sub areas of Campo Rotaliano called Pasquari, Novali and Pozze. Soil: Light farming soil, not very deep (50-70 cm), rather fertile and always well drained, supported by a rich multi-layered structure of pebbles, gravel and sand. Vinification and ageing: Traditional red vinification. Fermentation for 15 to 20 days, devatting and ageing in French oak barrels for at least 24 months. Refining: 4 to 6 months in a bottle prior to being put on the market. "Decanter World Wine Awards" has rated the wine "Cantina Rotaliana di Mezzolombardo Teroldego Rotaliano Riserva, Trentino-Alto Adige, Italy" from the vintage 2013 on 01.01.2017 with 86 of 100 points. 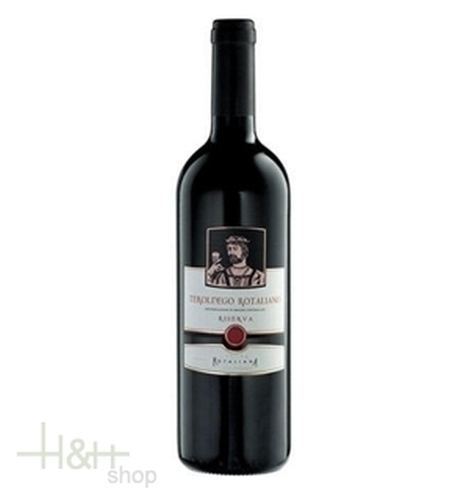 "Vinum Wine Magazine" has rated the wine "Cantina Rotaliana di Mezzolombardo Teroldego Rotaliano Riserva, Trentino-Alto Adige, Italy" from the vintage 2007 on 01.05.2011 with 15 of 20 points.